When it comes to dSLR photography, sharpness is often equated to quality. Sharper images simply look better. They tend to be more interesting because you can make out finer details. Small amounts of sharpening brings an image into better focus and improves its appearance. You can often apply this level of sharpening to the entire image or to select areas. Too much sharpening can ruin a photo by turning low-level noise into a high-level distraction and overemphasizing everything bad about the photo. You have different ways to sharpen photos in most editing programs. 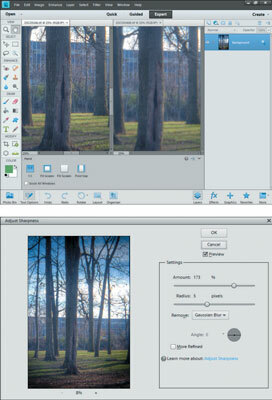 Two of the more interesting routines in Photoshop Elements are Unsharp Mask and Adjust Sharpness. Amount: How much to sharpen. In this case, the Amount was set to 70, which sounds like a lot but is less than you think. You can’t directly equate this setting to Strength because the Radius option plays an important part in sharpening. Radius: How wide an area to sharpen around the edge being sharpened. Small amounts restrict the effect to closer edges, and larger amounts extend sharpening outward. Leave the Radius value low in cases where you want minimal sharpening. Experiment with larger values to increase the sharpening effect. Threshold: Lets you customize the onset of sharpening. At low values, everything is sharpened; at high values, sharpening still occurs, but not over the entire image. You can leave Threshold set to 0 if you don’t have time to try to figure out the correct amount. Choose Enhance →Adjust Sharpness for another sharpening method. This type has a few different options than Unsharp Mask. 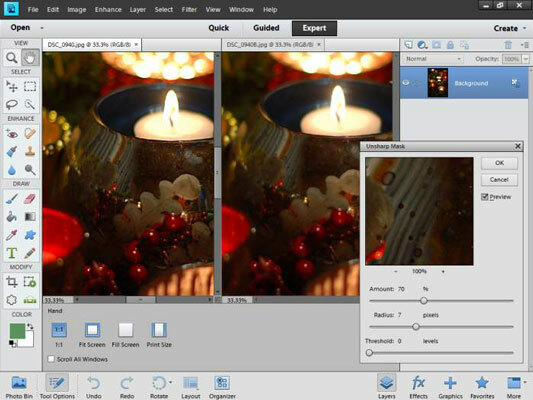 Select a sharpening type from the Remove list: Gaussian Blur, Lens Blur, or Motion Blur. The former is supposed to be exactly like Unsharp Mask. It’s difficult to tell much difference between the three. Choose Motion Blur to sharpen an image blurred by camera movement. The trees and building in the background sharpen up nicely. Experiment with layer blending (editing tools that stack on top of each other). Duplicate a layer, sharpen it, and lower its opacity so that it blends in with the unsharpened layer below it. Use the Eraser (or a mask) to tailor the amount of sharpness even more by erasing areas on the sharpened layer so that they have no sharpness applied to them.